The gestation of the Fire and Rose concerts has taken some time. I have felt the concept of contemporary devotional singing growing within me but it was not until early October, 2013 that ideas came to fruition with the development of the inaugural concert at The White Eagle Lodge in Liss, Hampshire. I have been singing devotionally since 2002, when I began my MA in Transpersonal Psychotherapy research into the effect of the voice on the mind/body/spirit complex. A vocal technique called Sounding, a way of singing improvisationally without words, quickly developed and I have been singing that way ever since. It was in my work as part of At-Ma – a world music fusion trio that is a collaboration between myself, multi-instrumentalist composer and producer Craig Pruess and dynamic and sensitive tabla player, Tom Simenauer (Tabla Tom), that I was able to really explore and develop Sounding. With At-Ma we play contemporary music, expressing a unique and accessible blend of Western and Eastern influences. Link below for more information. However, I still felt there was something more to be found. Then I met Lucinda Drayton at the Yoga Show in Olympia. I fell in love with her voice straight away, and knew I needed to work with her. After much discussion, Lucinda initiated the project, ‘The Gathering.’ In this there are four musicians, Marcus Cliffe on bass, Phil Hudson on guitar, Signy Jakobsdottir on percussion and Michael Timothy on keyboards with Lucinda and myself on vocals. A week spent in a barn in Cornwall in 2011, once again improvising, produced our first album, ‘Startled By The Familiar.’ Lucinda mainly sings the songs with lyrics while I weave around her with Sounding. This gives the songs a unique flavour and otherworldly feeling. Link below for more information. It was watching Amjad Ali Khan with the Kronos quartet at the Barbican that gave me a final clue as to how the form of the concert might take place. Amjad Ali Khan is a wonderful Azerbaijan singer who draws from the repertoire of Azerbaijani ashiqs – oral-tradition singer-songwriters whose song texts portray, often with wry humor and searing irony, the power of love and the pain of separation. It is also a Turkish blend of song, dance, poetry and pantomime which has Sufi Islam at its core. The rawness and aliveness of the performance was so exciting and it is my desire to bring that element into these concerts. At the core of the concerts is my relationship with Lucinda. It is very powerful to have a male and female who have done a great deal of self-development, spiritual growth and training to become therapists. Singing together in harmony has the effect of bringing balance to the enterprise that is felt on a very deep level by those in the audience. We are supported by a pool of musicians who bring a lot in terms of experience, sensitivity, great talent and ability. Andy Blisset and Marcus Cliffe on keyboards, Phil Hudson on guitar and Signy Jakobsdottir on percussion. There are also three wonderful dancers, Pearl Jordan, Jeanefer Jean-Charles and Martha, who are all therapists and healers. Our dancers will intermingle with the songs and poems, bringing even more depth to the experience. At this point in the concert there is a space for musicians/singers/dancers to perform, from the local area where the concerts are held. Following this Lucinda and I come together, with the dancers, to sing ‘The Gathering’ material together for the rest of the concert – material that is joyous and upbeat. I am the fire to Lucinda’s Rose. 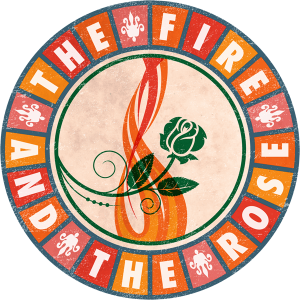 If the world wishes, these ‘Fire and the Rose’ concerts will take music, poetry and dance to where they are needed. To raise money for charitable causes, to bring together singers and musicians from different cultures especially in those parts of the world where there is strife, war and conflict. To say it doesn’t have to be this way, it can be something else. Listen, feel, open your heart and sing with us as a new spiritual tradition in devotional music is born. Calling out to all charities! Would you like to be a part of something that is unique and exciting – that helps raise awareness and bring people together?